Embraer, just prior to the 2018 National Business Aviation Association’s Business Aviation Convention and Exhibition (NBAA-BACE) in Orlando, introduced its new Praetor 500 midsize and Praetor 600 super-midsize business jets. Both new jets – described by the company as disruptive in their class – are on static display at the Orlando Executive Airport from October 16 to 18. 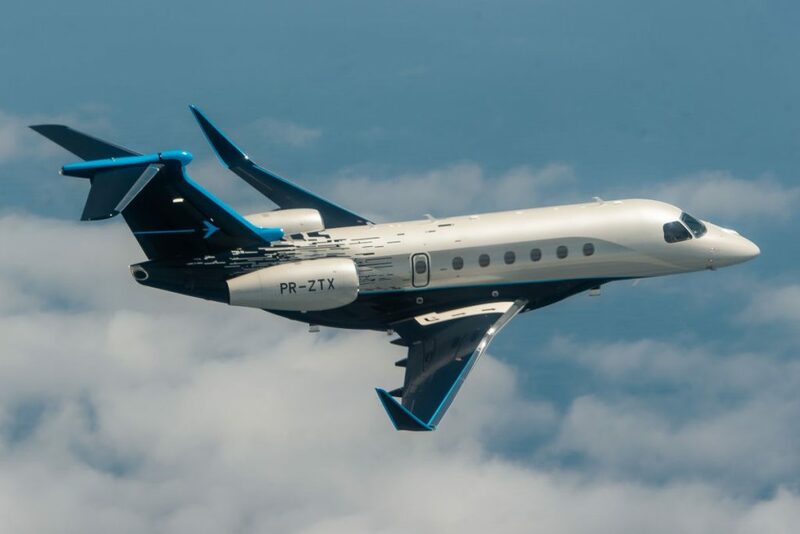 Embraer explains the Praetor 600 will be the farthest-flying super-midsize business jet, which allows nonstop flights between London and New York. The Praetor 500 will be the fastest midsize aircraft, continues the company, capable of reaching Europe from the west coast of the U.S. with a single stop. Both the Praetor 500 and 600 are powered by two Honeywell HTF 7500E turbofan engines. With four passengers and NBAA IFR Reserves, the Praetor 600 will have an intercontinental range of 3,900 nautical miles (7,223 km) and the Praetor 500 will have a continental range of 3,250 nautical miles (6,019 km). “The new Praetor 500 and Praetor 600 will be the most disruptive and technologically advanced aircraft to enter the midsize and super-midsize categories,” said Luciano Froes, senior VP, marketing, Embraer Executive Jets. Embraer also points to the industry-exclusive Upper Tech Panel found in the cabin of these jets, which displays flight information and offers cabin management features also available on personal devices through Honeywell Ovation Select. The aircraft also include Viasat’s Ka-band with speeds of up to 16Mbps and IPTV, which Embraer describes as another industry-exclusive in midsize and super-midsize business jets. The company describes the Praetor 500 and 600 as the only midsize and super-midsize business jets with full fly-by-wire technology and active turbulence reduction, providing for smooth flight, complemented by a 5,800-foot cabin altitude for ultimate passenger comfort. To celebrate these new aircraft, Embraer is also introducing the new Bossa Nova interior edition. The Praetor jets feature Rockwell Collins ProLine Fusion flight deck with what Embraer says is the industry-first vertical weather display, air-traffic-control-like situational awareness with ADSB-IN, and predictive wind shear radar capability. The Praetor cockpits will also offer options that include the Embraer Enhanced Vision System (E2VS) with a Head-up Display (HUD) and an Enhanced Video System (EVS), an Inertial Reference System (IRS) and a Synthetic Vision Guidance System (SVGS).